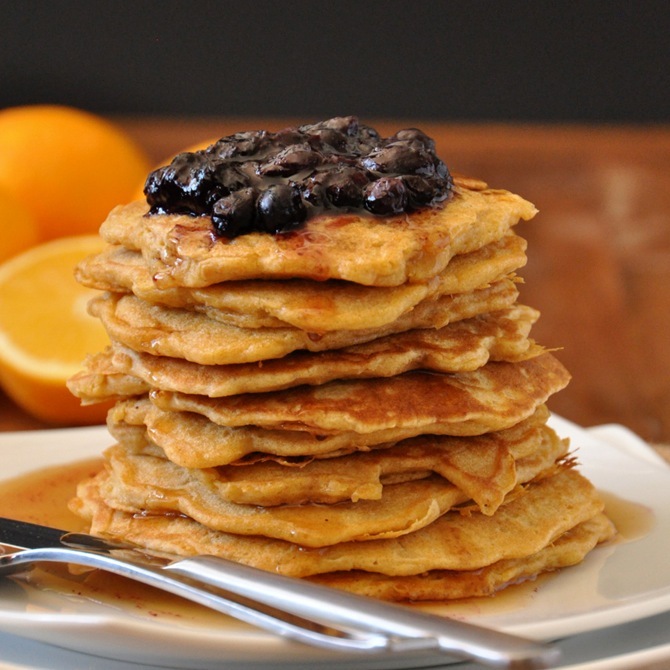 It doesn’t get much better than a warm stack of pancakes on a weekend morning. I’ve loved them ever since I was a wee Dana and they were the only thing my mom could coax me out of bed with in the morning before school. It may have been pitch black outside and my body was fighting with all its might to remain at rest, but if I knew there was a hot stack of pancakes waiting for me I would somehow muster the energy to get to the breakfast table – sometimes crawling. Well this is embarrassing, but when I was in grade school I was such a morning hater that my mom used to bundle me up in my blanket and carry me – yes carry me – to the kitchen where I’d sit slumped over on a breakfast bar stool. This proves three things: 1) my 5 foot 2 inch mother is saint, 2) I was an extremely spoiled child, and 3) pancakes have always been there for me. 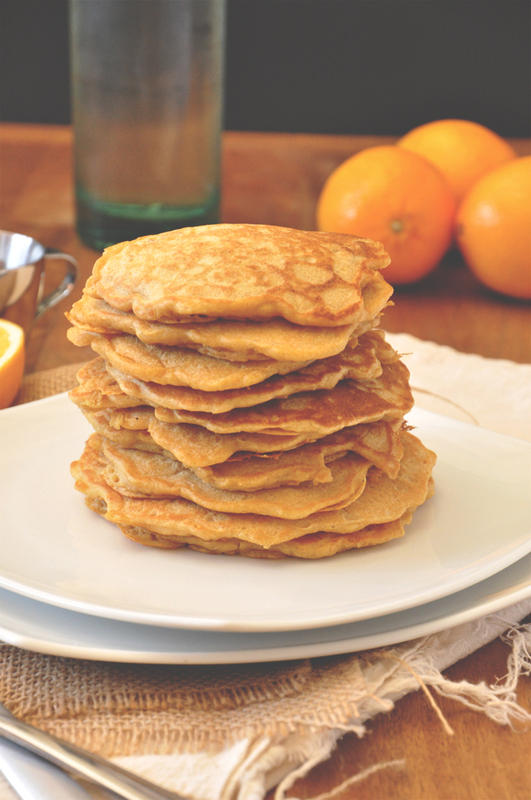 These pancakes are less like a traditional pan- “cake” and more of a griddle cake, which is defined as “a flat cake of thin batter fried on both sides on a griddle.” They’re similar to a pancake but the batter is thinner and they’re not as sweet – more hearty, if you will. Plenty of whole wheat flour, oats, a touch of butter and sugar, an egg, and some buttermilk. These are about as minimalist as they come, just the way I like it. And the compote? Amazing. Warm blueberries with orange juice and zest and a touch of sugar. I considered adding an herb but it just didn’t seem right. When you have a good thing going don’t be tempted to throw in more “things” just for the sake of being exotic. Sometimes all you need are the basics (most of the time as far as I’m concerned). How do they taste? These griddle cakes are all kinds of delicious – light in texture, slightly less fluffy than a pancake, not overly sweet and seriously satisfying. 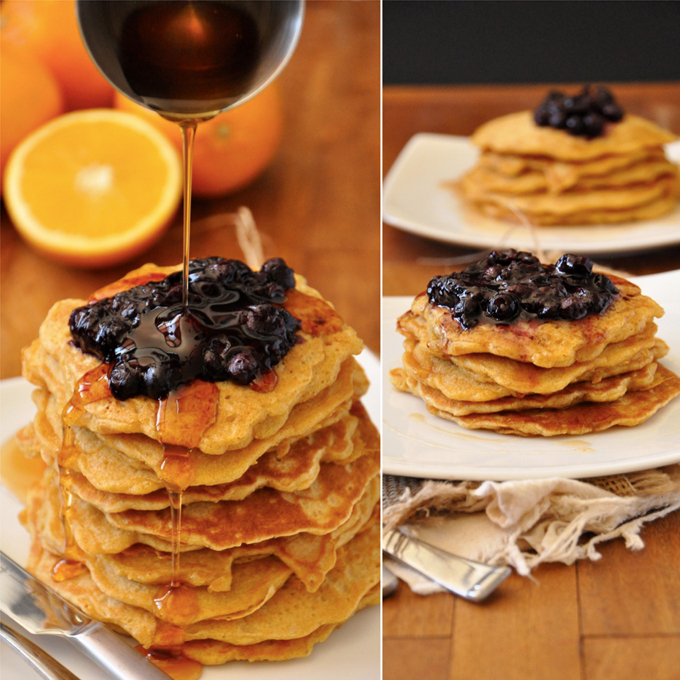 The blueberry orange compote is the perfect addition to make this a complete meal. Syrup is certainly optional, but if it’s the weekend, I say go for it. 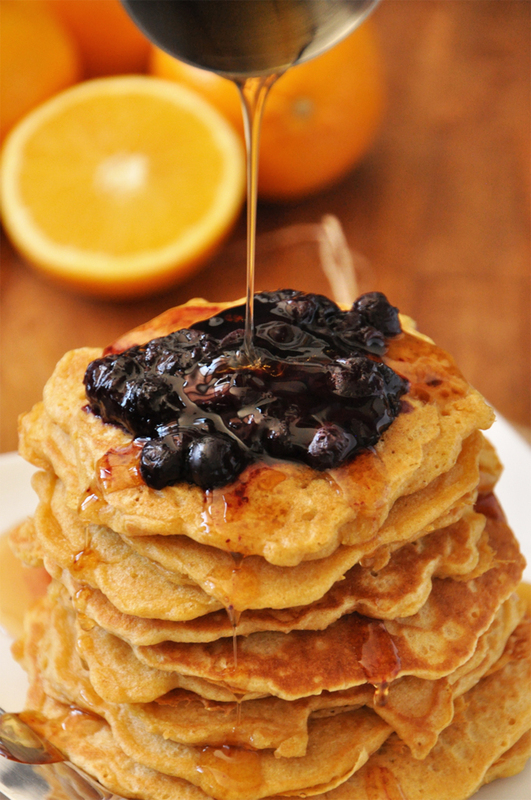 Whole wheat and oat griddle cakes with a warm blueberry orange compote. A perfectly healthy and delicious way to start the day. Preheat griddle to medium heat and place a small saucepan over medium heat. Add blueberries, sugar, orange juice and orange zest and bring to a simmer, mashing the berries with the back of a spoon. Once warm, bubbly and thickened, remove from heat and set aside. Whisk together dry ingredients in a large bowl. Mix wet ingredients separately and combine the two, stirring until just combined. Spoon scant 1/4 cup measurements onto the lightly greased griddle and cook until bubbles form on top and the edges appear slightly dry - the underneath should be golden brown (about 2 minutes). Flip and cook on the other side for 1-2 minutes more or until golden brown underneath. 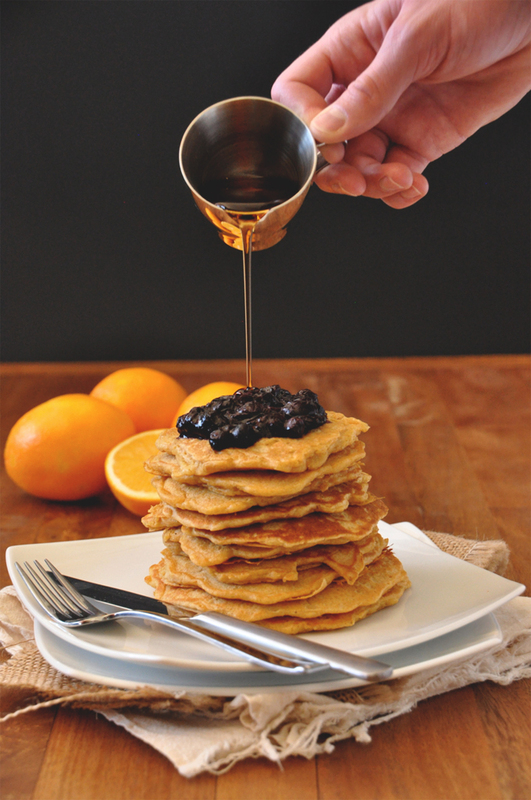 Serve warm with orange blueberry compote and maple syrup. *These store well in a plastic bag or Tupperware container in the fridge for a couple of days. Otherwise, freeze for up to one month. how can i make this vegan without compromising taste. ive been vegan for a year now and have yet to find a great pancake recipe. Help! These were a big hit at a family brunch. I like to make a double batch then freeze the leftovers. This morning when I made them I added fresh chopped peaches to the batter. YUM! These look and sound delicious! Going to make them this weekend. But what I really love is the story of mom taking time to make breakfast. My mom always had breakfast waiting for us before going to school. How many mothers today do this for their children before heading off to school. Such warm memories! This post made me giggle. Even though pancakes didn’t quite get me out of bed in the mornings (since I grew up on the Krusteaz mix stuff, ew), I love that vision of your mom carrying you to a fat stack of pancakes! And I love your distinction between pan- “cake” and griddle cake–I’m usually a fan of the former, but these look lovely and delicious! 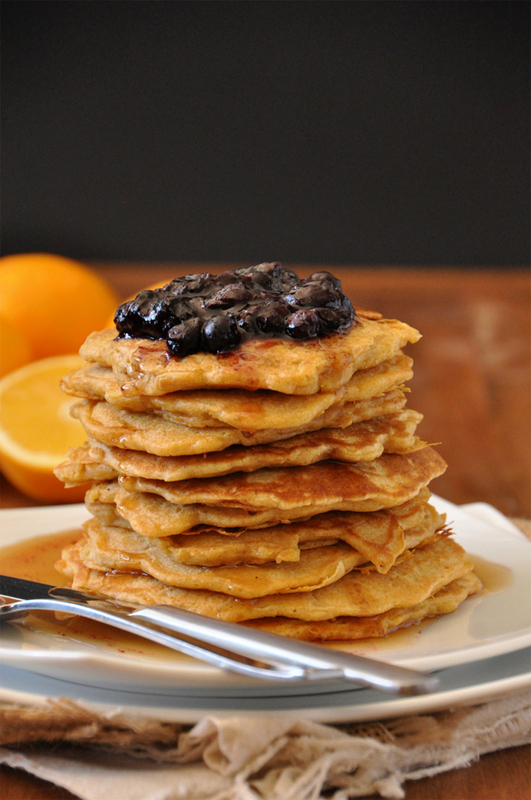 i prefer super thin pancakes (or griddle cakes) so these sound RIGHT up my alley! This sounds and looks GREAT…I’ll look forward to making this…..
Oh my goodness, your mother does sound like a saint! What a sweet story that was, I bet you were an adorable morning grouch. And you have now successfully created a healthier pancake. It’s like building a better mousetrap. Kudos! 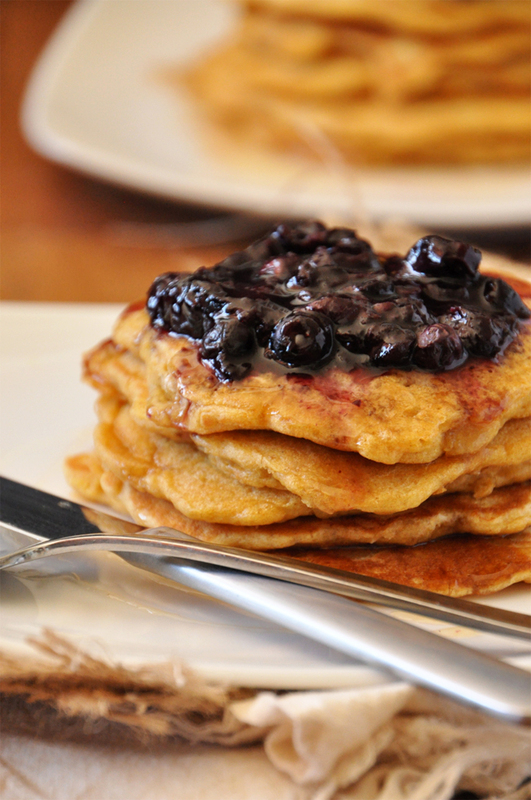 Pancakes, griddle cakes, flapjacks, I adore them all! 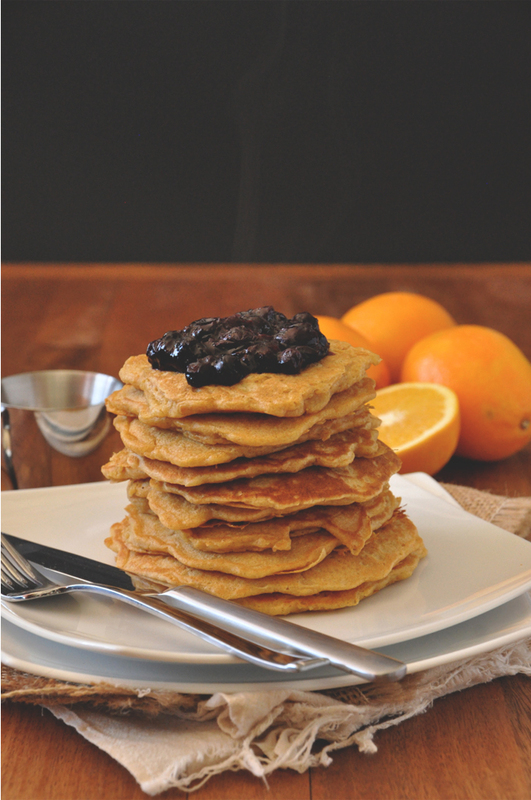 It is truly my absolute fave breakfast food, and it simple doesn’t get better than this combination with blueberry and orange! Yummy! I recently discovered the glory of freezing leftover pancakes! These would be a great batch to try next.